By working in my family’s business in India, I learned how communities can be impacted by global trade and also how they can become very dependent on it. Most products we buy, or at least some of their components, have touched more than one continent, hundreds of processes, and countless number of hands. This insight into the impact on communities through trade inspired me to start Handmade Expressions in 2005 with our focus being on poverty reduction by creating jobs in areas most marginalized. A large percentage of India’s population lives in rural areas with insufficient access to jobs or markets. They do, however, have access to traditional artforms, and can hand-make beautiful products for international trade. Women also benefit from this economic empowerment, enabling them to support their families, gain skills and confidence, and become more independent. However, it is not easy to manage a supply chain that connects rural artisans and U.S. buyers. One of the key strategies we adopted from the beginning was to focus on one country; we built our team in India to provide the on-ground support for communities to successfully engage in international trade. We also decided to focus on communities in need, rather than communities that are already involved in trade. This made our job even harder, yet it was central to our mission. It also gave us access to artforms and products that are more unique, as well as stronger direct partnerships with the artisans. With years of hard work by our design team and our India sourcing team, along with the motivation of our artisan partners, we are proud today to have a strong product line and more than 1,300 retail partners in North America, Australia and the UK. We provide sustainable economic opportunities to a network of 20,000 artisans; 75 percent of which are women and 80 percent live in poor rural areas (where only 39 percent of people are employed). What we realized in this journey is that once communities start to gain economic independence, they can take charge of their own development needs. Responsible trade leads to good jobs, which in turn fosters community development — win-win-win! Since our beginning, Handmade Expressions has engaged in numerous projects in our partner communities, including solar lamps, education for women, water filtration and conservation, health camps, and skills and training workshops. In 2012 we completed 25 such projects totaling over $15,000. A thriving environment is also critical to our mission, which requires a renewed focus on how we do business. This is especially challenging because it involves so many aspects of our operations — raw material sourcing, production processes, packaging, shipping, and even product lifecycles. Each of these elements requires in-depth analysis to understand the impacts and explore possible alternatives. For example, our jewelry artisans buy metal from local traders. To trace which mines the metals come from, which mills purify it, and what processes are used can be overwhelming for a company our size. At times we wrestled with conflicts between creating employment and safeguarding the environment. We had to invest in learning the impacts, establish parameters around sourcing materials, and focus on big areas of impact while taking small steps each year. As a result of our commitment, we have established a list of preferred materials and 72 percent of Handmade Expressions’ products use these sustainable resources. The preferred materials list is based on the impact the materials have on our people and planet during their production, use and end of lifecycle. We include aspects such as amount of water used in production, toxicity of the process, renewability of the resources used, and compostability. Our goals are to use preferred materials as much as possible in our products, and to launch two product collections each year using only preferred materials. We would like to use preferred materials for 100 percent of our products; however, we have to balance the two key aspects of our mission, people and planet. Some of our artisan groups practice artforms that cannot utilize preferred materials or use processes that are not completely safe for the environment. For us it becomes a crossroads between supporting communities with much-needed job creation or using only the most sustainable materials on our list. We can achieve both goals, but it will take time. We start by working with communities that need jobs and, as the relationship and trust grows, we share why it is important to move to more sustainable materials and processes. Then we can begin the process of converting to materials that align with our sustainable goals. We support the artisans with research, logistics and financing as needed to help with the transition. Within a short time, we can make significant changes towards sustainable production. For example, we worked with our batik artisans to help them shift to using non-toxic dyes. This could not have been done if we were not a trusted partner. In our packaging we replaced polythene with bags made from upcycled saris. 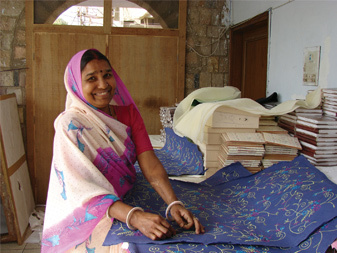 Previously worn saris are discarded, but many still have patches of fabric that can be used. 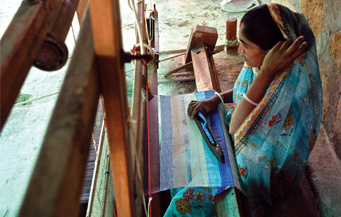 The old saris are cut and stitched to create a bag. The vibrant sari fabric bags are fun and reusable compared to polybags, which are made of non-biodegradable material and end up in landfills and polluting oceans. Moving over from polybags to upcycled sari bags saves thousands of pounds of synthetic material from being produced. In addition to recycling materials, the production of sari bags provides a significant number of jobs for women in need of employment. We also reduced our inbound shipping-related carbon emissions by 41 percent in 2012, and our outbound shipments are now 90-percent carbon-neutral. The majority of our carbon footprint was related to shipping products from India to the United States via air freight to expedite delivery. To improve our inventory control and reduce our carbon footprint, we now closely monitor inventory and sales. More than half of our products (51 percent) are compostable at the end of their lifespans. For a product to be considered sustainable, we must not only look at how it is made, but what happens at the end of its life. Handmade Expressions wants our products to merge back into nature through composting, which then provides our planet the ability to recreate the resources. The key to making compostable materials is using natural materials and not combining them with non-natural materials in such a way that makes it hard to separate. For instance, while the cotton we use is compostable, adding a zipper makes the item non-compostable. At the same time, customers want a way to close their bags. This takes a creative solution. Our design team is experimenting with different ways to create bags without plastic or metallic accessories. One example includes a yoga mat bag that has knotted fabric buttons instead of zippers. For our wood products, we use natural wax as varnish, which keeps them compostable and also makes them safe for children. We track how many of our new products are compostable as a way to keep us focused on this aspect. In addition, we do not use new polyester fibers in our products. The next phase of our sustainability evolution brought the people that purchase our products. Although our products are made responsibly, we are a very small part of the marketplace. For a larger shift in global production, consumers need to be aware of the practices they endorse through all of their purchases. We share our story and message in our product tags, website, catalog, newsletter, social media and events. In 2012 we hosted an extensive artisan tour in 10 U.S. cities to create a dialog between artisans and shoppers, and we’re planning a campaign to raise awareness about the interconnectivity of purchases in a global context. With commitment and creativity, Handmade Expressions has built a strong foundation of sustainability. I have to admit that it’s not always easy to stick to the mission and turn down short-term opportunities; yet this journey is incredibly rewarding. The satisfaction of making direct, positive impacts for producers and our environment, and growing a global base of informed ethical consumers, keeps us going and striving for more. I like the idea of first focusing energy on the artisan communities in need as these are the groups that are most in need of support. Through the support of these projects, it has helped make their lives much better. Additionally, these products they created are eco-friendly as they use natural materials that do not harm the environment when they decompose. We need to preserve this traditional handicraft for our younger generation. Well done Handmade Expressions! PS: There is also this other site I came across that promotes handicrafts from these skillful artisans (http://GiftsTimeless.com) and it is kind of interesting to browse. I like the idea of first channeling energy to the communities in need and helping these groups to improve their lives. Additionally, the products they produced are eco-friendly as the materials used are natural and do not harm the environment when they decompose. These traditional handicraft should be preserved for our future generations. Well done Handmade Expressions for promoting awareness of this fading trade. PS. I also came across this site that supports artisan crafts and it is worth a browse. http://GiftsTimeless.com.